Her youngest son was 4-years-old and attended a nearby preschool, but it was only for a few hours a week and she thought it might be important to give him an extra boost before he entered kindergarten the following year. She attended a short training with other parents to learn more about Waterford UPSTART where the group discussed the importance of setting routines around learning and was instructed on how to use Waterford UPSTART’s online software. Then she and her son both set out to work on the program back at home. Over the past five years, states have increased funding to pre-K programs by 47 percent. Yet, 40 percent of four-year-olds and 64 percent of three-year-olds still do not attend preschool in the United States, making us near the lowest among our peer countries in preschool attendance. There remains a large gap in providing enriching experiences for young children in this early period of critical brain development to set the foundation for learning and life. The Waterford Institute created the UPSTART program to directly address this gap and opportunity. Founded in Utah ten years ago at a time when there was no state-level funding for pre-K, Waterford UPSTART started by offering an in-home kindergarten readiness program with a simple premise: Primary caregivers and their children need to set early routines around learning and engage with quality learning content. Children spend 15 minutes a day, five days a week working with an online program with a focus on reading, math, and science. Families are paired with a parent care representative who monitors their child’s progress throughout the year and provides families access to live help by phone or email six days per week. Parents also receive a weekly email with program information and offline learning activity suggestions. All of this is free for families, and for those who need it, Waterford UPSTART provides families with a computer and access to internet. The results have proved outstanding. External evaluations consistently show that children in the Waterford UPSTART program significantly outperform their peers on the Brigance and Bader, two-well known screening tools. And those results stick. 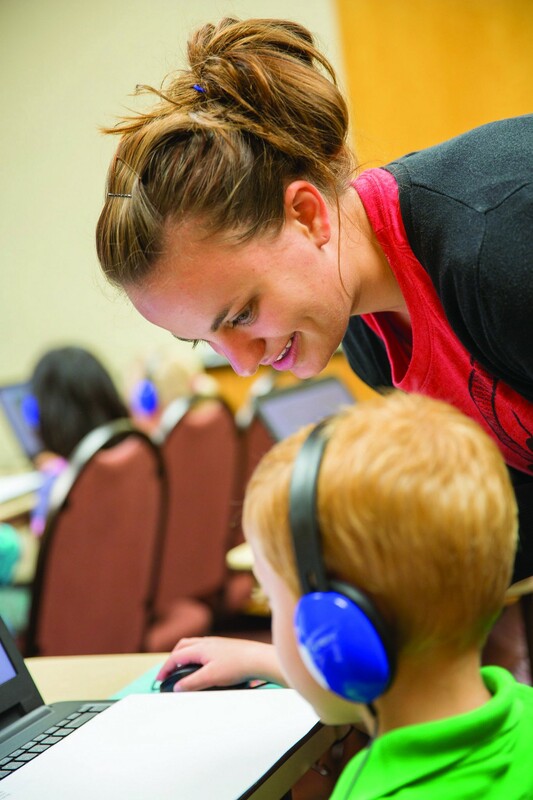 An independent longitudinal evaluation by the Utah State Office of Education shows children who participated in Waterford UPSTART the year before kindergarten saw immediate positive gains and were still outperforming state averages on standardized tests in grades first through fourth. With these results, Waterford UPSTART has worked with the State of Utah to expand access to the program for nearly 15,000 children annually. At the same time, the State of Utah, recognizing the importance of early childhood education, has expanded access to other early childhood experiences, including more traditional center-based environments. Yet in many parts of Utah, and across the US, residents of rural communities must endure long travel times to reach a pre-K center, and some families, even those who have access, simply are not ready to send their child to school at age four. For these families, Waterford UPSTART provides a proven option to support them in engaging in high-quality early childhood experiences with their children and preparing them for school. At Omidyar Network, we are investing in solutions that seek to improve the development and educational outcomes of children birth to age five, a time of life that sets a critical foundation for an individual’s future of learning, work, and life. We approach early childhood with the recognition that, at this life stage, families want the best for their children but may have different priorities for the types of enriching experiences they seek out. Waterford UPSTART provides one way for families to support and develop their young children. We are thrilled to partner with Waterford UPSTART as they build on this successful track record in Utah and expand to other locations and contexts. Waterford UPSTART is now running pilot programs in Idaho, Indiana, Louisiana, Mississippi, Ohio, Pennsylvania, and South Carolina with the most recent sites launching in Arizona, California, Colorado, and South Dakota. Additionally, they have another pilot that will soon launch in Oklahoma with Native American children. Beyond Waterford UPSTART’s original in-home program, they are also expanding to integrate their program into everything from in-home daycares to traditional preschool programs. And while the Waterford UPSTART program may enter new states and contexts, it still maintains its core elements — free, quality, engaging online learning content, and maybe most importantly, the parent care representative who is a phone call away with support, feedback, and coaching to help parents and caregivers to more actively engage and set routines around learning from the start. Preparing children for kindergarten requires the work of all caregivers in a child’s life, and Waterford UPSTART’s parent care representatives add one more helping hand. Principal of Academy Early Learning in South Carolina, Stacy Willbanks shared, “I think the children using UPSTART now will enter kindergarten ready — I think they’ll be ready socio-emotionally. I think they’ll be ready academically. And I think we’ll see them flourish for years to come.” Kara and her son’s teacher agree. Kara “never dreamed the progress would be so amazing,” and her son’s teacher told her that he was “off the charts.” Through Kara’s engagement and some support from the Waterford UPSTART program, her son entered kindergarten ready to take advantage of all that lay ahead of him in school and in life. We are excited to be on this learning journey with Waterford UPSTART and all the families and children they reach.